Following the installation of Mandriva Linux on my desktop PC, I have been unable to simply access shares on my FSG3 Network Storage box. But I can't browse all of the shares. On looking at the smb.conf file (which is located on the FSG3 in the /usr/local/samba/lib directory, it is clear that it doesn't actualy have any specified ones (unless you are the administrator). 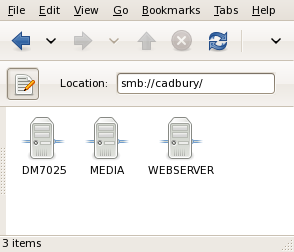 I have therefore modified the /usr/local/samba/lib/smb.conf file to include a 'HOME' section, as shown below. 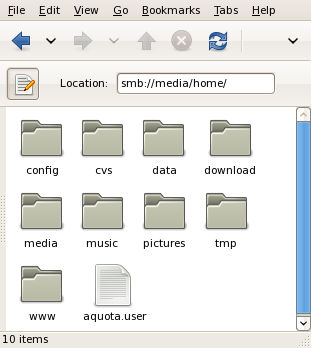 I can now browse to smb://media/home, and see all of the user areas. Note that unix file and directory permissions still apply, and that you have to be logged in as the correct user, and be in the correct group.